Universities, hospitals, medical research institutions and tertiary education facilities are significant contributors to Greater Sydney’s economy. By 2036, 21 per cent of all jobs in Greater Sydney are projected to be in the health and education sectors, up from 19 per cent today. Planned investment in major health facilities at Westmead, Nepean, Campbelltown, Randwick and the Northern Beaches is more than $3.58 billion, creating significant local opportunities for direct jobs and growth in ancillary services. Providing a range of accommodation for moderate-income households and students accessible to health and education precincts contributes to the productivity of the precincts. In addition to these current investments the NSW Government has identified the need for a future hospital in the north west. 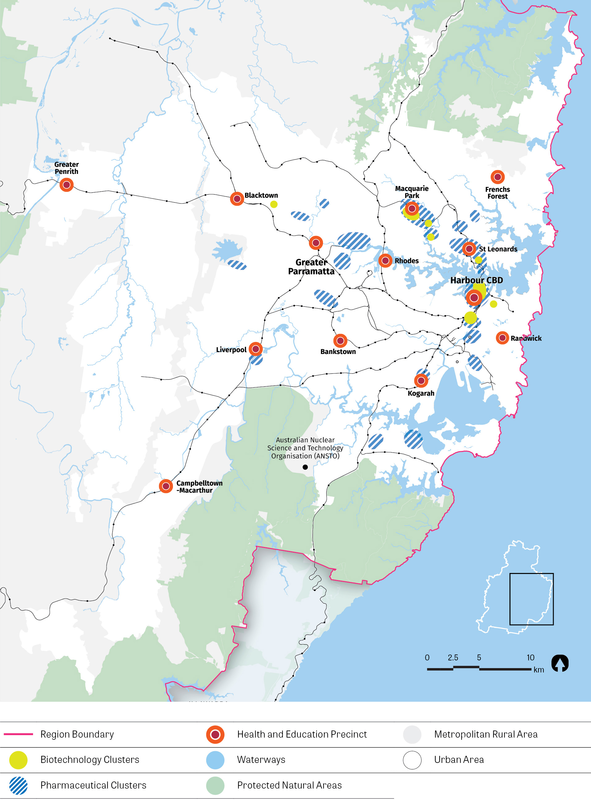 Greater Sydney’s health and education precincts and current medical industry clusters, such as pharmaceutical and biotechnology, are identified in Figure 37. 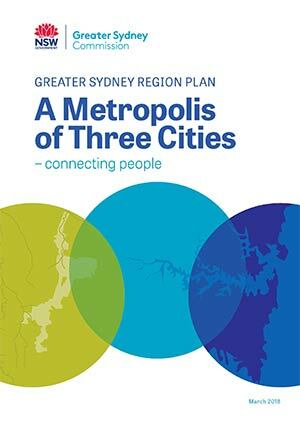 Existing health and education precincts form part of some metropolitan and strategic centres (refer to Objective 22.) It is anticipated that over time additional health and education precincts will emerge. Health and education precincts offer many opportunities to drive and support international competitiveness. Tertiary education institutions are a key factor in the development of health and education precincts. In turn these institutions drive a major export service industry. In 2016, NSW had the highest number of overseas student enrolments in Australia, with 106,000 enrolments in higher education and 139,000 students in vocational and English language courses30. Education is the largest export service industry in NSW. In fact, international enrolments are growing at a faster rate than domestic enrolments. New campuses are continuing to open – Western Sydney University has expanded into Greater Parramatta and is expanding into Liverpool. The University of Wollongong has a campus in Liverpool, with commitments for another facility in Liverpool. Health care is provided through a comprehensive network of services across Greater Sydney ranging from large principal referral hospitals providing highly complex emergency and planned services, through to care in people’s homes and community health centres. It includes ambulance services, local hospitals, population health and preventative services, mental health services, primary care including general practice, allied health services, pharmacy, dental care and residential aged care. There is a wide range and diversity of services delivered by different levels of government as well as the private and not-for-profit sectors. Integration across all services is pivotal to efficient and effective delivery of health care. The acute hospital system on its own cannot meet the changing needs of the community where people are living longer, often with chronic and complex healthcare needs, including mental illnesses. The challenge is to develop models of care, partnerships across the health sector, funding streams, new workforce models and eHealth31 solutions to create the connected healthcare system that is needed now and for the future. Technology is being used to support the healthcare system as it changes and evolves, with eHealth being embedded into everyday models of care that help link patients, service providers and communities in a connected, smarter healthcare system. eHealth and other technologies will enable a stronger approach to delivery of care in the home, leading to different approaches to accessing and delivering health care. The health and education precincts will effectively connect the community’s healthcare services, education and digital economy infrastructure. The precincts, together with initiatives to implement alternatives to hospital-based models of care, improve system integration, reduce variation in care, and implement preventative health measures. They will deliver strong social, environmental and economic benefits. Local health and education facilities, such as local hospitals, local health services, TAFEs and schools play an important role in the community as places where people work, learn and access services. Local health and education facilities, such as local hospitals, local health services, TAFEs and schools play an important role in the community as places where people work, learn and access services. The most successful health and education precincts are internationally competitive and more accurately described as innovation districts32. Innovation districts are transit-accessible precincts with an active ecosystem that includes health and education assets, surrounded by a network of medical research institutions, a mix of complementary industry tenants, housing, ancillary facilities and services. Economic productivity is created by the agglomeration benefits flowing from an active innovation ecosystem. A benchmarking study indicates that the evolution of health and education precincts follow a Maturity Pathway. As precincts evolve, the economic productivity of the precinct increases substantially. This corresponds to three general models, which become progressively more complex: Clusters, Precincts and Innovation Districts. This Maturity Pathway and the corresponding models are shown in Figure 38. The identified health and education precincts are at different points along the Maturity Pathway and therefore need differing responses (refer to Figure 39). It is not expected that all precincts will achieve sufficient critical mass to develop into an Innovation District. Industry: (anchor institutions) initial establishment of medical research institute with organic ‘medtech’ growth, supported by accelerators and venture capital firms; establishment of a new institute in a precinct will occur after consideration of the facilities necessary to accelerate the evolution of a cluster into an innovation precinct. There are benefits from involvement of all three stakeholders to progress health and education precincts along the Maturity Pathway. It is recognised that health and education precincts each have relative competitive advantages influencing their capacity to progress along the Maturity Pathway, which can impact on investment. The governance of health and education precincts may involve a Collaboration Areas approach. Collaboration Areas provide a governance and a policy framework to coordinate placed-based innovation and investment. Precinct-shaping projects: projects involving one or more of the anchors aligned to deliver against broader precinct objectives. facilitate housing opportunities for students and workers within 30 minutes of the precinct. The Greater Sydney Commission to coordinate the established governance arrangements and drive the delivery of place-based outcomes.